The Beltones ("I Talk To My Echo") had a convoluted history, intertwined with the Love Larks, the 5 Sharps, the Symbols, and the Masters. The original Beltones came from the South Jamaica Projects (along with the Rivileers, the Cellos, the Deltairs, the The Cleftones, and the 5 Sharps). Both Wilbur "Buzzy" Brown (second tenor) and Robert Brown (bass; no relation to Buzzy) sang with the Love Larks (who started out in 1952 as the "Bencholeers," since they hung around the same benches that the Rivileers used for practice). The other Love Larks were Pete Le Monier (lead), Bobby Ward (another second tenor), and Billy Boatswain (first tenor). All except Pete went to Woodrow Wilson High School; Pete attended Jamaica High. "We sang on benches and in subways, in nightclubs and after hours spots. And plenty of times we didn't get paid," says Buzzy. 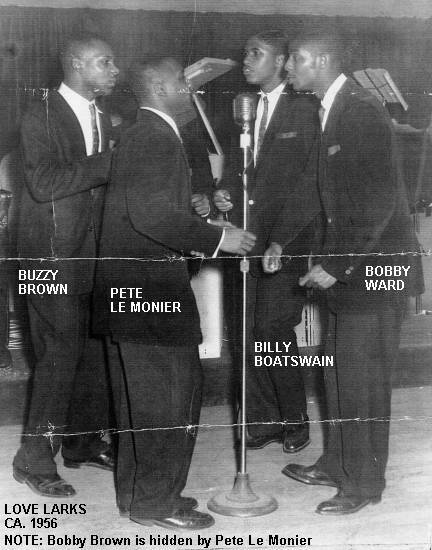 Singing was too much fun to be restrictive: Bobby Ward also sang with the 5 Sharps and Robert Brown was one of the founders of the Beltones. The Beltones also contained Andrew Pope (lead), Clayton "Dickie" Williams (first tenor), and Herb Rooney (baritone). The Love Larks started getting more and more gigs, and Robert Brown decided to abandon the Beltones and cast his lot with them. "We were very serious," says Robert, "but we sounded a lot like the Cleftones and we couldn't get off the ground." [Note that they were not the Love Larks that recorded "Diddle-Le-Bom."] The Beltones replaced him with bass Alva Martin, and, in August 1956, did some recording for Hull Records: "I Talk To My Echo" and "Oof Goof," both led by Andrew Pope. For whatever reason, the tunes weren't released until the Spring of 1957. When the record failed to take off, Hull lost interest in the Beltones and never asked them to do any more recording. Since the Love Larks had broken up by then, Robert Brown returned to the Beltones as bass, replacing Alva Martin. 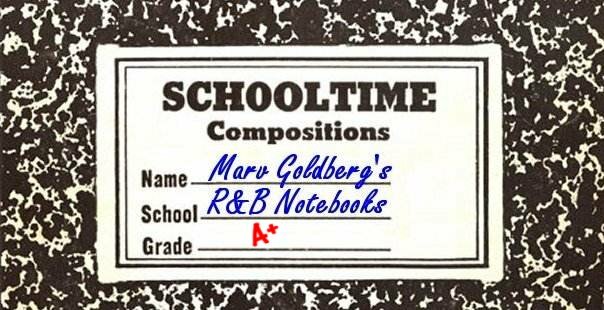 (Martin became a sax player and arranger; he was on the Isley Brothers' smash 1969 hit "It's Your Thing," which was produced by Herb Rooney.) Robert brought his Love Lark pal Wilbur "Buzzy" Brown (second tenor) with him, to make it a quintet. Then Herb Rooney departed, and in his place they got tenor George "Buster" Cottman. 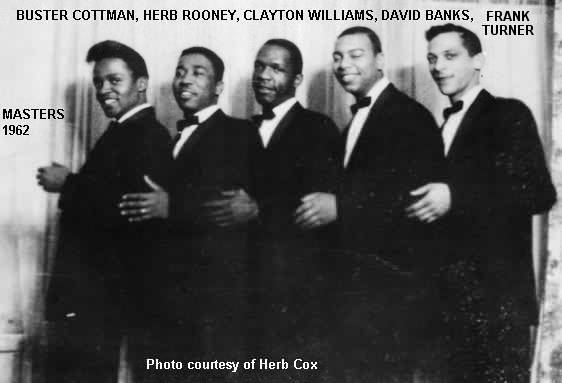 Thus, the Beltones now consisted of Andrew Pope, Clayton "Dickie" Williams, Wilbur "Buzzy" Brown, Robert Brown, and George "Buster" Cottman. Instead of securing a release from Hull, however, the renewed Beltones just decided to go up the block to Hy Weiss' Old Town Records (which was at 1697 Broadway at the time). In the spring of 1958, they recorded four tunes, backed by the Buddy Lucas Orchestra: "Crying My Heart Out" (led by Buster), "Lover, Lover, Lover" (Buster), "Country Boy" (Andrew), and "Last Rose Of Summer" (Andrew). (The authorship of all four tunes was credited to Andrew Pope and Hy Weiss.) While they were still called the Beltones at this point (a fact borne out by a newspaper photo from December 1958), the Old Town tape boxes were labeled "The Symbols" (and all four songs have been released in the last couple of years on Ace Records' Old Town series). Since Robert Brown had a faint memory of the group talking about changing its name to the Symbols, it looks like they decided to try it out for a short time. Somehow, however, Hull found out about the recordings, and cried "breach of contract." Old Town thus never released any of the tunes at the time. Around 1960, things were going downhill for the group. "We were running around doing little things," says Robert. Buzzy adds that they played "little shows, dances, weddings; even a Jewish Center." Andrew Pope finally went into the army, and Buzzy drifted away. Note that the contemporaneous Belltones (on J&S and Scatt) were a different group. Then, determined to keep singing, Robert Brown, Dickie Williams, and Buster Cottman got baritone Herb Rooney back again, and lead baritone David Banks was added. Finally, they did away with the "Beltones" altogether: the name of the group was changed to the Masters. This is the group that recorded "A Man Is Not Supposed To Cry" and "Look Out" for End Records, released in November 1961. The former song was led by Buster Cottman, the latter by David Banks. Before they could do any further recording, however, Robert Brown got drafted and was replaced by Frank Turner. When Andrew Pope had gone into the army, Buster Cottman had asked him for permission to record "Crying My Heart Out" (which Pope had written and the Beltones/Symbols had recorded for Old Town). Pope agreed, and the Masters recorded it for the Le Sage label in 1962 (however, the label shows Buster's name as writer!). 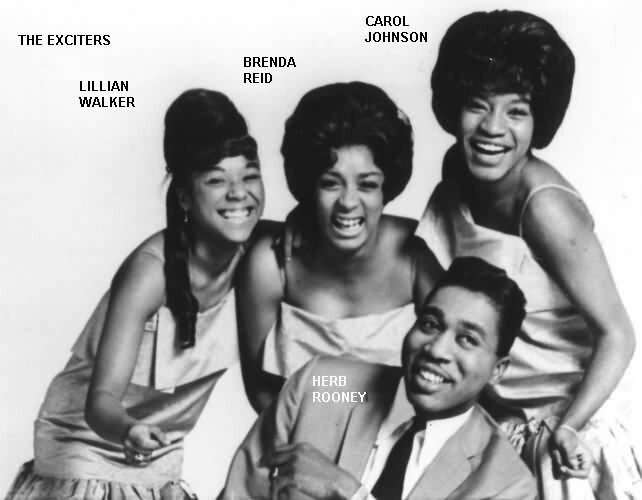 The Masters had a sister group, the Masterettes, which consisted of Brenda Reid, Carol Johnson, Lillian Walker, and Sylvia Wilbur. They also had a single record on Le Sage: "Follow The Leader" and "Never Ever," with Brenda in the lead. For some reason, Buster Cottman didn't like Herb Rooney and forced him out of the Masters soon after "Crying My Heart Out" was released. Herb then joined the Masterettes, which caused Sylvia Wilbur to leave. 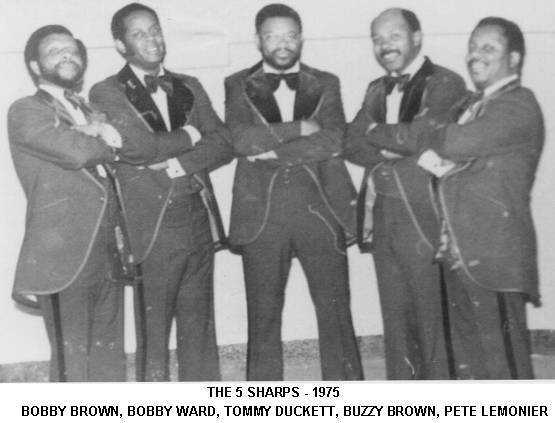 A South Jamaica Projects reunion took place in 1975, when Robert Ward got his Love Larks buddies back together to appear as the 5 Sharps. Pete Le Monier was there, so was Robert Brown, Buzzy Brown, and the man who played piano for all the Projects groups: Tommy Duckett.